• We recently made a new internet friend in Chef James. For all you food lovers out there, check out his web site www.foodreference.com today! • The good folks at Hampton Inns have included our Catsup bottle Summerfest in their new events calendar. It's titled "Hampton's Year of 1,000 Weekends" - A one-of-a-kind Travel Guide and Weekend Activities Calendar. We love Hampton Inns and their efforts to help preserve and promote Route 66 and historic landmarks around the country. Thanks, guys! • This was a pleasant surprise. While checking out at our local downtown drug store, we discovered the new Wunnenberg's Street Guide for Madison County features the Catsup bottle on the cover! • Mel Schlemer stopped by the office and brought us this great old picture that we are thrilled to add to our archives. In it a young Mr. Schlemer presents the Future Farmers of America's 1952 Certificate of Appreciation to Charles Suppiger, V.P. of the G.S. Suppiger Company. • Congratulations go out to our long-time Catsup Bottle Buddy, Mr. Jamie Jensen. The 3rd edition of his book "Road Trip USA" has recently been published. Way to go, Jamie! It's a great book that covers great road trips like Route 66, U.S. 50, the Great River Road, the Lincoln Highway, and more. Of course, our favorite part is the inside back cover flap with the photo of the author and the Catsup Bottle! • Did you happen to catch the Gameshow Network's new show "Cram" this past week? If so, you would have seen the World's Largest Catsup Bottle in Collinsville, Illinois used as one of the questions and answers! Yep, this stuff even freaks us out sometimes. No word on whether the contestant got it right or not, but we know that you know! • The Catsup Bottle Lady, Judy DeMoisy, gives a well-received presentation to students at Renfro Elementary School. She explained the processes of historic preservation, restoring the water tower, and the hopes and dreams of future Catsup Bottle projects. The kids were really into it and had plenty of ideas of their own! A great time was had by all. • We received a nice email from Alice Novak. She teaches historic preservation at the University of Illinois and was adding our web site to her students' web list. Very cool! She said they all thought she was joking when she told them about the World's Largest Catsup Bottle... oh, ye, of little faith! • The new postcards are here! The new postcards are here! • The great educational powerhouse Scholastic features a link to us on its web site! The January edition of the online version of the Classroom Magazine "DynaMath" has "Golfing Goodies," "Dr. Brainy's Mind Benders," and the "World's Largest Catsup Bottle." • Keep a look out for American Magazine, American Road, and St. Louis Magazine. We sent photos to each of them for use in an upcoming issue. • Our friend Joe Natale and his partner in crime Sara Craddock just returned from a trip to Ronda, Spain. Thanks you guys for taking the Catsup Bottle with you! • At the Heartland Travel Tradeshow in Chicago, Carla Anderson of the Collinsville Convention and Visitors Bureau sponsored a breakfast for tour operators. Helping her highlight our area were Cathleen Lindauer from Belleville Tourism, and Mary Kay Way from the Shrine of Our Lady of the Snows. The Catsup Bottle t-shirts were a huge hit! • We received an email from a new friend living in Amagasaki, Japan. Akkey says he is a big fan of catsup and of our web site, promises to stop by on his next road trip down Route 66. Which, by the way, will be his 7th since 1994! • Kristin Korte, the K-3 Special Education Teacher at Hollywood Heights Elementary School (Collinsville Unit 10 District), created a project where her students share things from their community with students in Australia. We were happy to donate a few Catsup Bottle items for the box! We hope to get a couple of pix of the kids soon. • We just discovered a fantastic web site called "The Grand Canyon Project." This is a great story from Jane Chase Vickers and Amy Rich, directors of the children's art program at Patchwork Central, a small non-profit organization in inner-city Evansville, Indiana. They traveled out west on a journey of art and discovery, and made the Catsup Bottle one of their stops along the way. We were amazed at their success and hope everyone will take the time to visit their site. • The Missouri Historical Society has included a couple of Catsup Bottle photos in their special exhibit called "Memory." It runs now until April 27, 2003. • We just received the very first edition "RPPN Bulletin", the newsletter from our friends at the Recent Past Preservation Network. RPPN is a non-profit organization "promoting preservation education, assistance, and advocacy to encourage a contextual understanding of our modern built environment." The Network has a great web site and brings people together interested in protecting an often misunderstood and under-appreciated era of design. They are always looking for new information and new members - check 'em out! • World famous for his rambles, Roadie Mike (no relation to Big Tomato Mike) gives us this article about Paul Bunyon, Superman, and the Catsup Bottle. Learn more about folk heroes and condiments immortalized in places where culture and chrome meet asphalt and art. • While perusing www.foodreference.com, Chef Jeannie Sammis of Alexander City, Alabama, discovered a listing for our upcoming Summerfest and couldn't resist the pangs of curiousity to check us out! eannie writes the "On Cooking" column for the Alexander City Outlook and suddenly we were the subject of her next article! Jeannie became a Fan Club member and quick friends with all of us here at Catsup Bottle Central Command. Thanks, Chef Sammis, pour it on! We're also pleased to report that every once in a while you can still catch the "Record Breakers" episode of "Unwrapped" that features the Catsup Bottle. Check the Food Network listings for rerun schedule of both of these great shows! • Although the battle for the Superman water tower was recently lost, the good fight continues in Dunnellon, Florida. Residents in this community have banded together to restore their historic landmark and things are moving along! To help their cause, the Save The Water Tower group has even registered the name "Bass Capital of the World" as Dunnellon is famous for its gooooood bass fishin'! We just received this historic photo of their tower. • Today is the realease date for our Summerfest press release posted on the PRWeb.com service. We're listed #2 in the travel section, #16 nation-wide, and #18 world-wide. • Our release is picked up and posted on World City Hotels web site. • Special thanks go to GreatRiverRoad.com, Red Gold Tomatoes, California Route 66, StLcalendar.com, Festivals.com, By The Way Magazine, and others for including us on their events calendars. • We recently got a visit from Lea York, a Collinsville resident and sponsorship representative for Sheltering Wings, a non-profit sponsorship organization reaching out to needy children around the globe. She shared with us some photos of kids in Burkina Faso, Africa (near the Ivory Coast), wearing their Catsup Bottle shirts and some pretty cute smiles. • The latest edition of St. Louis Magazine arrived today via the fine folks of the United States Postal Service. The cover story features Mr. Wayne Hagin, the new voice of the St. Louis Cardinals. And just as important (to us anyway), low and behold, inside in the "Ask STL Mag" section we find the Catsup Bottle! The question is: "What happened to the original Brooks Catsup factory in the Kerry Patch area?" Do you know the answer to that one? • The war in Iraq is now a week old, and we hesitated to send out our latest email update feeling that it might seem a bit inappropriate right now. Buuuuut we sent it, and we were glad to here from a lot of folks who welcome the diversion! Thanks, gang. In fact, we heard from a mom who's son is on a ship in the Persian Gulf and she was going to print out the Catsup Bottle web site and mail it to him and his buddies! • "Holy guacamole!" At first we thought our web site tracking software was broken... We woke up to find over 600 web hits by 9:00 a.m.! We're normally happy if we hit a hundred a day. The highest so far was just a couple weeks ago on March 29 when "Major Geeks" posted a link for us (thank you Tim, Jim and the gang!) and we reached 335 hits for that day... followed by days of 282 and 263 hits. • And now this happens!!! As it turns out, "Webshots" listed us as its "Cool Site of the Day" for today. Thank you Webshots people! **WHEW!! ** We'll post the total hits after the smoke clears tomorrow morning!!! • Well, gang, it's tomorrow... let me catch my breath... we had 2,433 hits yesterday... totally unbelievable. Now, I'm sure there are millions of web sites out there that get 24 hundred hits a day... but it's not supposed to happen to us!!! What an incredible surprise!! And to top it all off, yesterday's onslaught put us over the 100,000 hits mark!! • The Collinsville Herald Journal covers the news of our milestone in a front page story by Curtiss Hartley entitled "Catsup Bottle Web Site is a Hit with Surfers Around the World". It also about in the online edition of the Suburban Journal section of StLtoday.com - Thanks, Curtiss, it was a great article! • It was a dreary morning this Saturday, but we made the best of it and had a great time with Mitch English, a host of the morning news program, "The Daily Buzz." Mitch, and photographer Eric Colley, were in town doing a story on St. Louis area attractions. It was also to include the Museum of Transportation and Blueberry Hill. We've got some good photos here, check 'em out! • "The Daily Buzz" airs between 6:00 am and 8:00 am on KPLR-WB11 in St. Louis and on 120 other stations around the country! As soon as we find out when our segment will be on, we'll post it here and send out a Fan Club emailing so everyone can watch! • An article mentioning the Catsup Bottle, and our friend Mike The Headless Chicken, appears on the MSNBC News web site. The piece by Reid Bramblett is in the Arthur Frommer's Budget Travel section. It's entitled "The Road Less Traveled" and it's about the 95 official "Scenic Byways" designated by the U.S. Secretary of Transportation for "outstanding archaeological, cultural, historical, natural, recreational, and scenic value." 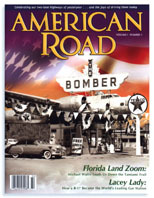 Thanks for refering to us as a "hallowed icon of Americana" - we appreciate that! By the way, of the 95 Scenic Byways in this country, three of them come to Collinsville! The Great River Road, Route 66, and the Route 40 National Road. • We just learned that the new parent company of Brooks ketchup is Birds Eye Foods. If you're looking to buy your favorite rich & tangy ketchup and can't find it in your area you may be able to talk to them about it. • We just received word from Mitch at The Daily Buzz letting us know that our segment of "Mitch Does St. Louis" will air on Monday, May 5, 2003 at about 6:40 am (CT). Everyone be sure to check it out! The nationally syndicated program runs from 6:00 am to 8:00 am on KPLR Channel 11 in St. Louis. Does it air in your city? Let's hope so!! • Thank you Eric and Mitch! The piece was great - nice job! And on the set, Ron Corning and Andrea Jackson were proud to show off their Fan Club certificates and membership cards.On top of all that, a friend said she saw promos for "the Daily Buzz" and the Catsup Bottle running during the St. Louis Cardinals baseball game broadcast the day before... that's pretty darn cool...!! We've got some good photos here, check 'em out! • Sue Strobl from Dunnellon, Florida, sent us some pix of autographed mementos from her trip to the "Today" show in New York City. Her trip to the Big Apple helped in the effort to save the water tower in Dunnellon. The featured fotos by Jim Huston come courtesy of Catsup Bottle Fans Sharon and Jim at www.totallyillogical.com - thanks guys! • Hey, hey! The folks at MSN have now posted the "The Road Less Traveled" article by Reid Bramblett on their MSN Home Page "Your World" section -- translating into a huge number of web hits for us. It seriously looks like we may break the one-day hit record!!! • Things are really happening as we gear up for the 2003 Catsup Bottle Summerfest. Pieces are already scheduled to run in the summer issues of American Road, American Magazine, and Midwest Gaming and Travel. We've also been selected to be featured on AOL Digital City. • As seen previously, Hampton Inns have included us in their "Year of 1,000 Weekends Calendar" and now they are also featuring us in their video news release of their favorite travel festivals of the summer! • Those of you in the St. Louis area will really appreciate this one!! The one and only Becky Queen of Carpet will be seen flying around the Catsup Bottle during her new commercials. Thanks to some old friends in influential places, we were able to have an audience with her royal highness and she agreed to feature the Catsup Bottle and to also promote the Summerfest for us! Becky's Carpet & Tile Superstore is our first ever official media sponsor! Thank you, your Majesty!! And for those of you NOT in the St. Louis area, all we can say is "sorry, you're missing out!" • A friend recently stopped in the office and explaining that she had just seen the commercial exclaimed, "You might as well stop everything. You have definately arrived. You've made the big time, now. You can just go ahead and quit. Nothing can top this!" • The 2nd annual Kids WB! Way Outta The Way Road Trip promotion started yesterday. We've been working closely with the folks at Kids WB in Burbank, California for the last few weeks. The piece turned out great! • Our travel team, the Wacky Jackies, visited Collinsville looking for the Catsup Bottle. Unfortunately for them they got a little lost and ended up crashing into the legs and blasting the cap off and covering themselves with Brooks Tangy Catsup! Yum! • Okay, y'all, this one takes the cake. Waaaaay back a few months ago, while doing a little creative thinking "outside the box" as they say... an idea came to fruition. And after doing a little research I tracked down the big wigs behind the Killer Tomatoes franchise and sent a little email planting a seed that it would be really cool for them to be involved in our Catsup Bottle Festival. Imagine my surprise when a reply email came from Killer Tomato Corporate Counsel saying "Let's talk." • So we did. One thing lead to another and we've made some more great friends out in Burbank, California! Mike at KT Productions and Sam at Warner Strategic Marketing have been fantastic. We've already got some t-shirts in hand, and are expecting some more promotional items any day now. Thanks, guys! • Why all the hoopla? Well, this year is the 25th anniversary of the original cult classic "Attack of the Killer Tomatoes" movie, and Rhino Home Video will be releasing the special commemorative DVD this September! So watch out folks, they're back and ripe for revenge! • Warm up those vocal chords and join us for the "Attack of the Killer Tomatoes" theme song sing-a-long/contest at 1:00 pm during the Catsup Bottle Summerfest on Sunday July, 6... sponsored by Rhino Home Video. • Well, well, well. How's this for exciting news?!? We just received confirmation that 2 of the lovely and talented St. Louis Rams Cheerleaders will be making an appearance at the Summerfest! They will be on hand at 12:00 noon until 3:00 pm. Many thanks go to Todd and Meg and all our friends at Evers Prescription Pharmacy in downtown Collinsville for making this possible! • We also got word that Fox 2 Sunday Morning News will be sending a broadcast truck to the Catsup Bottle and having us on for a live interview. Be sure to tune in at 8:30 in the morning on Sunday! • Everything went really well with the interview on KTVI Fox 2 Sunday Morning news program. Mike had the pleasure of talking live with Jill Farmer and Len Turner in the studio to promote the Catsup Bottle Summerfest and the Killer Tomato sing-a-long. Mike was joined by Collinsville city councilman Joy Springer, her daughter Kollyn, and their awesome "Tomato Crate" pick-up truck! Thank you, Producer Jamie, for setting it all up!